Give the gift of live performance! LOH Gift Cards are available in denominations ranging from $20 to $200. Beautifully designed physical cards can be shipped anywhere, or you may choose electronic delivery by email or text. 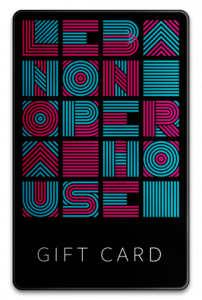 Gift Cards never expire and may be used for any show at LOH. They are also rechargeable, and can be redeemed in person at the LOH Box Office or over the phone. Can’t call at the moment? Drop us a line at info@lebanonoperahouse.org or leave a voicemail, and we’ll get back in touch with you. LOH Gift Cards are sold exclusively through our partners at Local Gift Cards.